Comic books continue their evolution into digital comics, where the sequential art form is available on mobile devices like the iPad and Android, game systems like the PSP, and web browsers. Expanding in distribution, getting more competitive with prices, and experimenting with interactivity – these are all good signs that digital comics might be growing from infant to toddler. After some delays, Dark Horse Comics will launch their anticipated Dark Horse Digital program later today. The system was built in-house and uses a web-based system supplemented by apps for the iPad, iPhone and iPod Touch. The comics will be priced starting at $1.49 $0.99 (versus competing apps that have comics starting at $1.99), and will be available in bundles as though you’re buying a full graphic novel collection. The app will be free and come loaded with the first issue of Hellboy: Seeds of Destruction by Mike Mignola and John Byrne. There will also be five free comics available: the first issues of Criminal Macabre by Steve Niles and Ben Templesmith, Joss Whedon‘s Fray, Mike Mignola’s Abe Sapien: The Drowning, Gerard Way‘s Umbrella Academy: Apocalypse Suite, and Mass Effect: Redemption. The app will have hundreds of other comics for download, including issues of Conan, Joss Whedon’s Serenity, Eric Powell‘s The Goon and more. An Android app will follow. 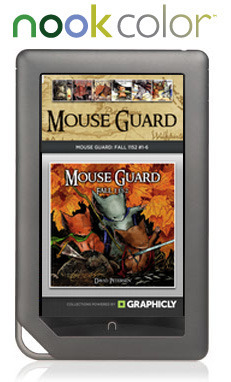 Meanwhile on the Nook Color, Barnes & Noble has launched a new app store which includes three graphic novel apps from Graphic.ly: Mouse Guard: Fall 1152 by David Petersen, Mark Millar and JG Jones‘ Wanted, and Mark Waid‘s Irredeemable. All of the apps have been specially optimized for the Nook Color e-reader, which uses Google’s Android platform. Graphicly also has digital comics from major comics publishers available on the iPad, iPhone/iPad Touch and Android, on the web, Adobe Air, and Google’s Chrome browser app. NBM Publishing and their all-ages Papercutz imprint has teamed up with TWP Interactive to produce what they are billing as the first interactive graphic novel, Dinosaurs Across America by Phil Yeh. (It’s not the first, but it’s still cool.) Dinosaurs Across America was first published as a traditional graphic novel in print in 2007. It was named one of the best 25 graphic novels of the year by School Library Journal and has won acclaim for its ability to teach geography to children. The new interactive edition allows the reader to zoom in on individual states, learn fun facts and play with puzzles. The interactive version is now available for $9.99 as an app for iOS devices (iPad, iPhone, iPod Touch), and for $4.99 as an e-book on Koobits. And finally, Archie Comics continues its aggressive pursuit of digital, launching Spanish language versions of some of their digital comics Monday. The comics are available on Archie Digital, as well as their iOS app for the iPad, iPhone and iPod Touch provided by iVerse, and the Sony PSP. An Android app is coming soon. Further translations into French and Hindi are planned as well.